Strong national policies can help children and families eat healthier foods and be active. By creating healthier schools, child-care settings and communities, these efforts can help children grow up at a healthy weight and make it easier for adults to lead healthy lives. The following set of national policies can serve as a set of priorities as leaders work to address the nation’s obesity epidemic. The Special Supplemental Nutrition Program for Women, Infants and Children (WIC) is one of the nation’s largest federal nutrition programs, serving nearly 7.3 million participants. The Child and Adult Food Care (CACFP) Program provides federal funding to states to reimburse providers for the cost of providing nutritious meals and snacks to children and adults in their care. The Healthy Food Financing Initiative (HFFI) is a public-private partnership that provides grants and loans to finance the construction and development of grocery stores and other healthy food retailers in underserved areas. The Affordable Care Act (ACA) required chain restaurants and similar food retail establishments with at least 20 locations nationwide to post calorie information on their menus and menu boards and provide additional nutrition information like saturated fat and added sugars to customers upon request. Every five years, the U.S. Departments of Agriculture (USDA) and Health and Human Services (HHS) jointly publish the Dietary Guidelines for Americans, a series of recommendations reflecting the latest nutrition science for how Americans ages 2 and older can maintain a healthy diet. Most packaged foods and beverages include a nutrition label to help consumers make healthy choices. Beginning in 2020, companies will be required to use revamped labels that better reflect current nutrition science and make the information easier to understand. Head Start is a comprehensive early childhood education program that helps prepare more than one million low-income children under the age of 5 for school every year by providing education, health and social services. More than 30 million children nationwide participate in the National School Lunch and School Breakfast Programs. Fifty-one percent of U.S. children now qualify for free and reduced-price school meals. Experts recommend at least 60 minutes of daily physical activity for children. Physical activity provides important benefits for children, including reducing the risk of obesity. Safe Routes to Schools (SRTS) promotes walking and biking to and from school by providing communities with resources to build sidewalks and bike paths, add crosswalks and improve lighting and signage to ensure safe conditions. Medicare is a government-run healthcare program serving 59 million Americans ages 65 and older. Medicaid serves more than 67 million low-income Americans or those with disabilities. CHIP covers more than 9 million children. More than 30 million Americans live with diabetes, a number that has tripled in the last 20 years. The Affordable Care Act (ACA) created the Prevention and Public Health Fund, the first mandatory funding stream dedicated to improving our nation’s public health. State-level policies also play an important role in preventing and reducing obesity. 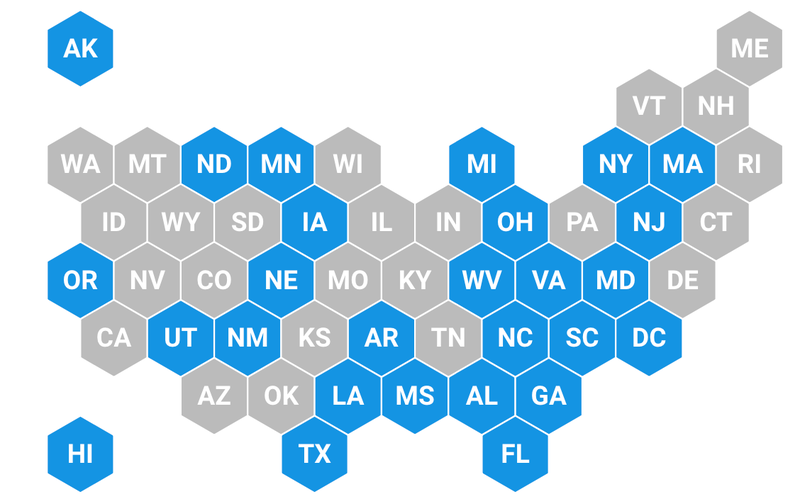 This feature tracks each state on more than 20 different policy efforts aimed at creating healthier communities for children and families.